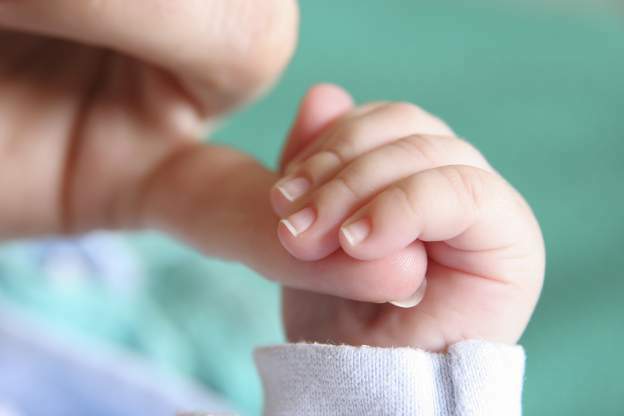 The skin of newborns may be flaky and dry because it has yet to mature. A young child’s skin is delicate and therefore vulnerable to becoming dry too. Lessening exposure to soapy water, chlorine and salt water as well as keeping children well-hydrated will help to maintain healthy skin. However, the possibility of children experiencing a skin condition is not totally eliminated with those measures. Dr Lian Wee Bin, Consultant Paediatrician of SpecialKids Child Health & Development Clinic, Dr Pan Jiun Yit, Consultant at National Skin Centre, and Dr Mark Koh, Head and Consultant of Dermatology Service at KK Women’s and Children’s Hospital (KKH), educate us on the eight most common skin conditions and infections that affect their young patients in Singapore. Eczema is a very common recurrent, itchy skin condition in children, also known as atopic dermatitis. Patients with atopic dermatitis may have personal or family history of other atopic diseases such as asthma and allergic rhinitis (hay fever). Children with this underlying condition have an impaired skin barrier, which can be more easily damaged by various environmental factors such as changes in climate and presence of dust mites in the home. 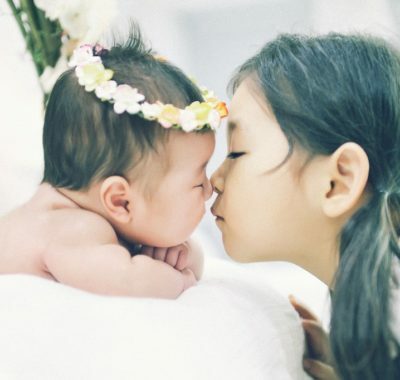 In Singapore, it affects up to twenty percent of children and can affect all age groups. Eczema commonly starts in infancy but some may experience it in childhood or later. In infants and babies, eczema commonly affects the scalp and face. The skin becomes inflamed, dry, itchy, scaly and red. It may cause stress and induce an inclination for the child to scratch the affected areas. However, persistent scratching may cause the condition to worsen and trigger an infection. If an infection occurs, the sore regions will appear wet and “weeping”. Contact with irritants such as soap, detergent, hot bath water, scratchy clothing materials and fragrances in the environment can trigger eczema. Children with eczema-prone skin should moisturise their skin frequently with a fragrance-free moisturiser, preferably after a shower. Reduce the amount of dust mites in your home and avoid accumulating stuffed toys, keeping pets and having carpets. Ensure that your child wears comfortable cotton clothing at all times. 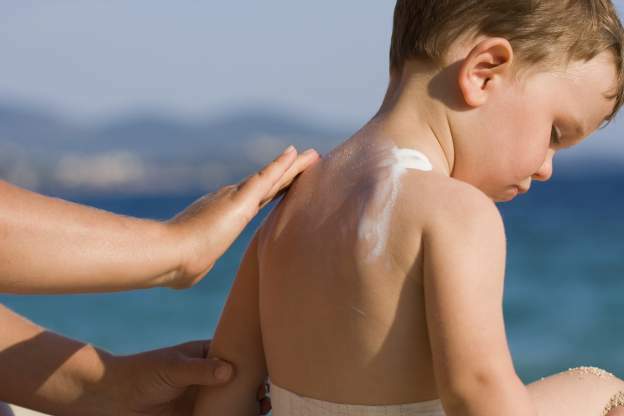 When going swimming, you will need to take extra precaution; do not let your child swim for too long, do not go for a swim when the weather is too hot, and moisturise immediately after swimming. If your child’s skin is inflamed, the use of topical steroids can be beneficial provided only a very thin layer of it is applied each time on the red, itchy and bumpy areas until the symptoms are relieved. If there is no visible relief of symptoms after two weeks of application, bring your child to be reviewed again by a doctor. Sedating oral antihistamines may also help to reduce the itch. When the eczema is infected, oral antibiotics are required. A rash is a change in skin colour and texture which is caused by inflammation due to many possible causes. Depending on the cause, rashes could show up in different forms. Rashes caused by viruses have a wide variety of appearances. The skin may thicken and adopt a leathery texture, show red blotches, have red bumpy spots and be dry and cracked. They may or may not itch. 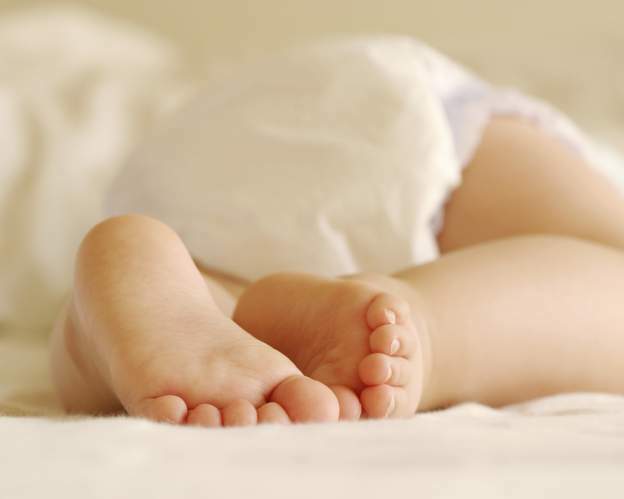 A generalised rash could be caused by soiled diapers that are left on for too long (diaper rash), an allergic reaction to a vaccination or medicines, or viral infections such as Hand, Foot & Mouth Disease (HFMD), chickenpox and roseola. It is extremely important to first rule out the possibility of the rash being a symptom of a serious infection, such as meningococcal disease. A non-threatening generalised rash can be treated by a doctor with the appropriate topical medications. Symptoms will then subside on their own within a span of a few days. Scabies is a contagious, itchy rash caused by mites. It can affect any part of the body, including the scalp of infants, but it is most commonly present on the hands, wrists and fingers. The itch may intensify at night. The rash ranges from not showing much of redness or inflammation, to crusted papules. Tiny female mites burrow into the skin and dig a tunnel to store their eggs. The itch is the response from the body to these parasites’ eggs and waste. The eggs mature in seven days and the cycle repeats itself. Immediately after every shower, dry your child’s body thoroughly and apply the prescribed medicated lotion from neck to toes. The lotion is meant to kill the mites and its application is to be repeated the following week when the eggs hatch. The most commonly used scabies medication is malathion. This is applied twice, with an interval of one week in between the applications. Alternatively, for infants, permethrin could be prescribed. Wash all your child’s bed linen in hot water and do not share the bed with your infected child. Dr. Koh suggests that all family members should also be treated at the same time. Impetigo is a type of bacterial skin infection that is seen most often in preschool children with underlying condition such as eczema, scabies, as well as insect bites, cuts and scrapes. It can also occur in patients with no underlying skin diseases. Blisters develop and break out and result in the appearance of crusted, yellow and scaly rashes. Lesions commonly occur around body orifices such as the nose, mouth and diaper area. Impetigo is mainly caused by poor hygiene and can be contagious though close contact. Normal saline or potassium permanganate soaks followed by topical anti-bacterial creams are sufficient for mild cases. Severe cases would require a course of oral antibiotics which would span about one to two weeks. When there is an overgrowth of the fungus, candida, it can result in an infection. Parts of the body that are usually affected are the moist skin folds such as those in the armpits, diaper area, and between the toes and fingers. The rashes can appear red or white in colour. The discomfort and itch can be rather intense. Affected skin tends to feel hot and sore and this may lead to cracking and swelling. Warm temperatures, tight clothing and poor hygiene are contributing factors to the cause of this fungal infection. Children who are on antibiotics, steroid therapy and chemotherapy face an increased risk of being infected. The practice of good hygiene by keeping skin washed regularly and dried properly, is very important to keep this fungal infection at bay. Ensure that your child’s skin is exposed to air. Use anti-fungal creams to prevent such infections. Anti-fungal powders are prescribed for patients who often have candida in regions of the body with moist skin folds. Reducing your child’s sugar intake may also aid in reducing the risk of the infection. Viral warts are abnormal skin growths which are caused by the human papilloma virus and are common in both children and adults. They are usually present on the hands and feet, although they can occur on any part of the body, including the face. Depending on the location of the warts, they can be flat and skin-coloured or cauliflower-like. They usually have a rough surface with tiny dark dots. They can also be rather painful, particularly if they are on the soles of the feet. The human papilloma virus is contagious and non-preventable. In babies and young children the warts often disappear by themselves, but the time needed to completely heal can take up to two years. Older children and adults may need to have the outer layer of their affected skin to be destroyed using the liquid nitrogen treatment which is also known as cryotherapy. Applying this very cold substance onto the skin will result in an effect similar to a burn. Blisters may form on the skin, after which the warts will dry and fall off. Other forms of treatment for children include application of salicylic acid on the warts and occlusion with duct tape. This is another skin infection caused by a poxvirus, which many older children and adults are immune to. 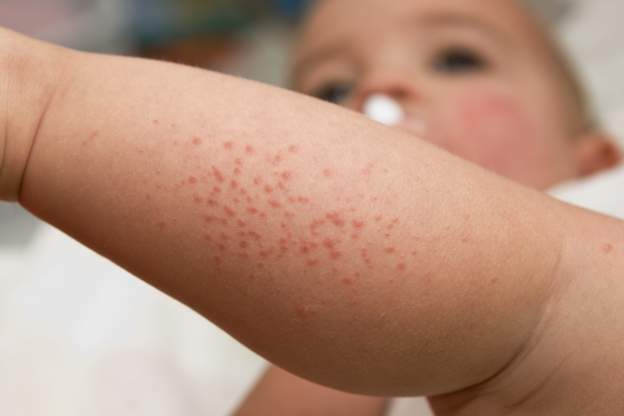 It can manifest itself on any part of a baby or toddler’s body as a single bump or in small clusters. It is usually painless but can be itchy. The rash would have bumps called mollusca with possibly indented centres in pink, white, or skin tones. The bumps contain white pus inside them which carry the contagious poxvirus. It is extremely important not to scratch at the bumps as they can become sore and get infected. The bumps may be exterminated through picking or curettage or cryotherapy, as well as by applying topical applications such as tretinoin or imiquimod, which must be prescribed by a physician. Cold sores are triggered by the Herpes Simplex Virus (HSV) Type 1, which also causes gingivostomatitis. Multiple groups of small painful blisters may appear around the mouth as well as on the lips, gums and tongue. The rash is red-coloured with fluid-filled lesions. Other symptoms may include fever, muscle aches, lethargy and irritability. The Herpes Simplex Virus is very contagious and young ones can get cold sores from kissing or sharing eating utensils with an infected person. The virus may recede by itself after one or two weeks, but it may recur during stressful periods. Cool foods and drinks, as well as pain-relief medications, may help to lessen the discomfort your child experiences. It is also important to wash your hands thoroughly after being in contact with your infected child.